In the 1976 season, young Vittorio Algeri of Itla won the Italian Championship “fi rst and second series” and the Settimana Lombarda (then for amateurs). All tla was ready for the big jump into professional sport. And, only just 2 years after being established, Rossin of Cavenago was ready to equip the “pros”. Ghezzi, Inzaghi and Garbelli signed an agreement with GBC of Jacopo Castelfranchi. “The new team of professionals, set up in January 1977 – announced Ghezzi – will be called GBC Itla”. And on the white jersey with red-blue band also appeared the Rossin pentagon-logo. 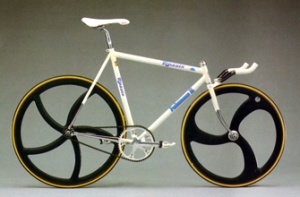 Rossin bikes made their debut in the Laigueglia Trophy in February ’77. The Algeri brothers, Roberto Ceruti, Gabriele Landoni, Walter Polini and the other GBC Itla boys obtained results in the major category riding fantastic bikes in the early months of ’77. The Rossin bicycle brand enjoys widespread consideration and appeal. 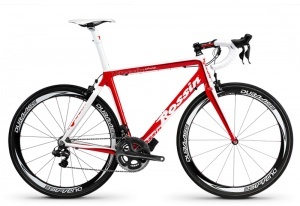 The history of Rossin bicycles is relatively short, but at the same time glorious. Rossin was born to win and astonish thanks to exclusive aesthetics and functional features. The year was 1973, the promising Gibi Baronchelli of the Iclas Sports Group won the Giro d’Italia baby and Tour de France amateurs. Iclas and Itla are the teams of the munifi cent patron Vittorio Ghezzi. Using bicycles provided by Ernesto Colnago, a popular manufacturer. Ghezzi and Domenico Garbelli, sports director and manager of Itla, wanted to create a team of professionals, above all to promote Baronchelli and other home-made talents into the higher category. The idea was to continue working with Colnago. But the Milan manufacturer was also the supplier of Scic, a team operating at professional level since ’69. And instead of favoring the birth of Ghezzi’s new professional team with the most promising athletes of the Itla nursery, Colnago facilitated Baronchelli’s move to Scic. This occurrence made patron Ghezzi, Alberto Inzaghi, Garbelli and the other members of the Itla staff really mad. Competitive 1973 had not yet come to a close. Despite this, Ghezzi and Garbelli changed their cyclists’ bikes. “We’ll finish the season with Bianchi. And the team will also be riding Bianchis in 1974”, says Ghezzi. In fact, the creative Inzaghi and Ghezzi wanted to pull something new out of the hat. Domenico Garbelli, always full of ideas, gave them the input: “Instead of promoting Colnago athletes, already well placed on the market, why don’t we start making top-quality bicycles and frames? We must be the strongly advancing new players. We have the skills and the means to make it“. Ghezzi approved the project: “Colnago is clever. No doubt about it. Let’s show it that we’re also clever in the fi eld. Let’s set up a company and manufacture highly competitive bikes”. Technically speaking, Garbelli’s ideas were very clear: “I have just the man we need to organize frame production - Mario Rossin – currently free. He worked for years in the Colnago welding department. He knows all the secrets of tubes and welding. He’s a wizard at measuring the athletes and making individuallytailored frames”. Mario Rossin, from Cavenago in Brianza, with Verona origins, was immediately involved in the project. And on 14 September, 1974, Rossin offi cially saw the light in Cavenago. 5 partners were involved in the project: Vittorio Ghezzi and his son Giuseppe, then Inzaghi, Garbelli and Rossin. “The bikes will be called Rossin”, agree Inzaghi, the Ghezzis, father and son, and Domenico. The new bike needs a brand. “While looking at the label on a bottle of Royal Cola – reveals Garbelli – I had a first inspiration. The other came to me looking at the wording on Rossignol skis. The “R” of the Rossin logo is a winning mix, with enhanced graphics”. The R is inserted in a pentagon. “Rossin has 5 founder fathers. That is why, as surrounding polygon, the pentagon was chosen”, continues Domenico. Today, almost twenty years after those legendary competitive accomplishments, by cherishing an inestimable heritage of know how, the Rossin brand, under the design impulse of the Bici Group, has polished up the shine of those years by re-presenting its historical bicycles on the market. By combining the know-how of the past with the cutting-edge innovations of bio-mechanics, the Rossin brand is once again synonymous with top-quality frames. Back in production is the Ghibli, a splendid bike that integrates the sturdiness of past experiences and the most modern technological solutions, both in terms of materials and aerodynamics. Lightweight and high performing, this Rossin gem is today a combination of top-class engineering solutions and appealing stylistic features; the ideal bike for those who, though projected into the future, love to pedal through history. Quality, experience and enthusiasm, a tribute to a glorious past – the new era of the Rossin brand has started.